Amanda Abbington, actress of Mary Morstan in Sherlock, received comments from "a small group" telling her to die. Sherlock's season three has already come to an end as has John Watson's (Martin Freeman) time as a bachelor. Amanda Abbington made her Sherlock debut as Mary Morstan, John's romantic interest and spouse as of "The Sign of Three." From time of the show's third season production to its air date, a small group of Sherlock fans have sent Abbington death threats. Abbington began receiving death threats while the third season was still in production. Freeman, Abbington's partner, spoke out about it a month ago, saying the people who sent death threats were "not fans of the show - they're fans of a show going on their heads." Speaking with The Times, Abbington revealed the types of comments she received once her role on the show was disclosed. "I got, 'She should die. How dare she play Mary Morstan? How dare she!'" Abbington said. "They take the John and Sherlock storyline so seriously that they wouldn't want anyone coming between them." 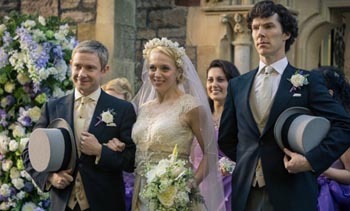 Mary and John marry in the second episode, and Sherlock gives them whatever blessings he can muster. For much of the series, the show jokes that John is gay and has feelings for Sherlock. And while it would be great to see a gay couple featured in a popular, mainstream show, the show's creators, as well as Freeman and Benedict Cumberbatch (Sherlock Holmes), have all made their intentions known: Sherlock and John were never going to be interested in each other romantically or sexually.